​​How Far Do Mosquitoes Travel From Their Nest? Mosquitoes can be a real pest, especially during the warmer months. These insects tend to live close to their breeding grounds. As most mosquitoes lay their eggs on fresh water, their homes include lakes, ponds, or any small puddles of fresh water they can find around your yard. Some mosquitoes have also adapted to lay their eggs on salt water too. These mosquitoes will lay their eggs in and around saltwater marshes. Even if you don’t live near any sources of water, mosquitoes will travel away from their breeding grounds in search of food. However, the distance they’re able to travel depends solely on the kind of mosquito involved. Some species of mosquito are capable of traveling much further than others. Generally speaking, mosquitoes do not like to travel very far from their nests, and prefer to feed as close to their home as possible. The majority of mosquitoes will not travel further than around three miles in search of food. It’s important to note that it’s only the female mosquitoes that need to feed on blood in order to successfully produce and lay eggs. There are a number of species of mosquito that have the ability to travel long distances. Some of these species are common to the midwest. These mosquitoes are able to travel as far as seven miles away from their breeding ground to feed. This is because some of the midwestern species of mosquitoes are physically larger, and are more substantially adept to reaching further distances. Ochlerotatus sollicitans can be found in areas across the midwest, as well as in Kentucky. 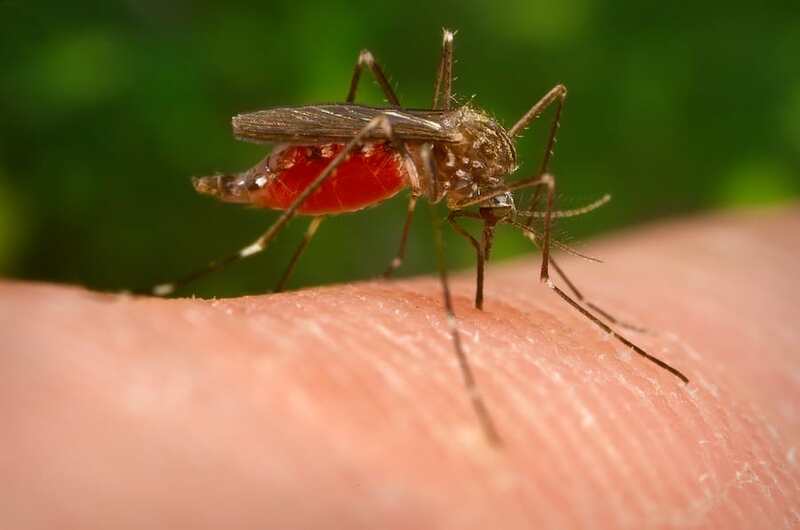 This species of mosquito can easily travel between five and 10 miles away from its breeding site. This distance can extend to 30 or even 40 miles, but only on windy days. Some mosquitoes that lay their eggs in saltwater are capable of flying up to 100 miles in search of food. However, this distance of travel is not very common. Species from saltwater areas are more likely to travel distances of no more than 40 miles away from their breeding grounds. The Aedes cantator and the Ochlerotatus taeniorhynchus are among the farthest flying species of mosquito. Aedes Cantator live primarily around Northeast America, particularly along the coastal areas. Ochlerotatus taeniorhynchus are found mainly along the Florida coast. However, their long flight range does not limit them to these areas. There are a few other factors that can affect how far a mosquito will travel away from its nest. One of the main factors being the weather, particularly wind. If the weather conditions are windy, mosquitoes may be carried much further away from their nests than usual. If weather conditions are windy where you live, you may find that mosquitoes are more common. This could even be the case if you don’t live close to a water source, where a mosquito may be laying its eggs. How far a mosquito will travel away from home is also dependent on the time of day. They tend to stay closer to their nest during the day and only travel out of the area in the early morning or evening. These are the times of day that mosquitoes prefer to feed, as they do not like intense light, heat, or cold. Mosquitoes will only travel away from their breeding site in search of food. Once they have found food, they are unlikely to stray any further. They want to stay as close to a water source as possible, as they will need to lay their eggs soon after feeding.